I just checked Tumblr again. A nice and fine service to quickly link and blog things. And to share articles with a click. Not that is it much other than on Facebook, or Google+, or any other social network. It's often complete articles. No one seems to care. I don't dare to try that on blogger.com up until now. But on the other hand, why should it be different? Does it matter? Why is this accepted on social networks, which are based on that behaviour, or Tumblr? I go a step further. 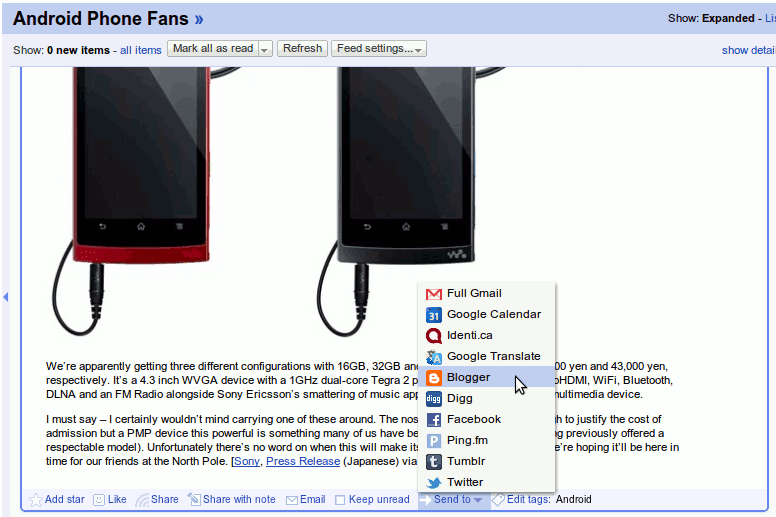 Google is offering a "Send to Blogger" feature in Google Reader. It embeds the complete article with pictures and everything that can be seen in the RSS-Feed. Why shouldn't I use this feature? I see no difference than sharing this to Tumblr or Facebook. And sharing a good article isn't something bad. It can drive traffic and attention to the original source, if linked and credited correctly. I wonder what you think about this. Is it fair to accept this on services like Tumblr and Facebook, but not on Blogger.com?